Diamond Dash is a fast-paced puzzle game from Wooga. The cheat is included in the leethax.net Firefox extension. 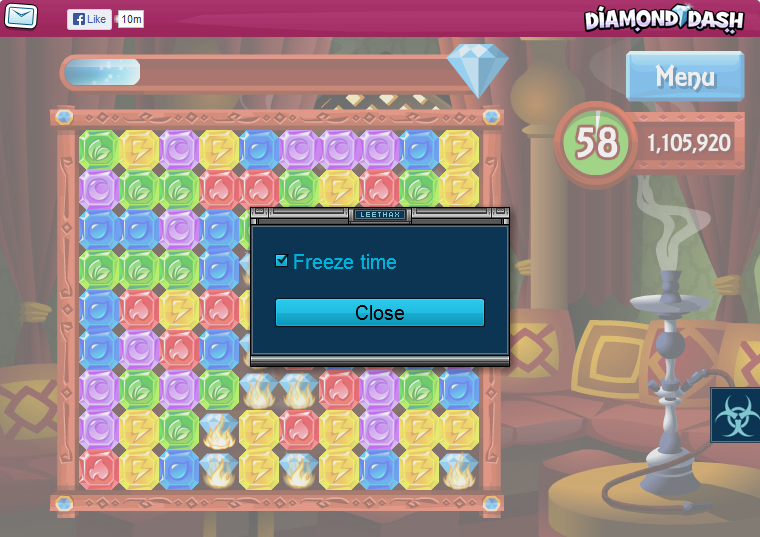 In Diamond Dash, the player is given 60 seconds to clear a grid of multi-colored gems. Adjacent gems of the same color form groups; the player can clear a group of three or more gems by clicking on it. Gems fall down to fill up the empty space created by clearing a group. The grid always remains filled with gems, as additional gems fall down from the top of the grid as necessary. By clearing groups quickly enough, the player can activate additional game features: filling up a diamond meter will cause diamonds to appear on the grid (clicking which invokes a fireball); or causing the grid to burst in flames after multiple successive matches, which causes an explosion with each match. Install the leethax.net browser extension, restart the web browser, and browse to the game's web page. Press the LeetHax button on the right to access the cheat interface. Hover your mouse over each option to see a detailed description. hi there several days ago i cant play diamond dash through mozzila is your problem or firefox? Yep, Layla is absolutely correct. Disable the security setting via that padlock symbol in the address bar and you should be able to load the app again in Firefox. Thanks Layla, can't believe I didn't think of it myself lol. Layla is right. Thank you for the solution! si è aggiornato firefox adesso non funziona piu per diamond dash.. Your Firefox plug-in doesn't work in Firefox 57. Please update it. Your Firefox plug-in doesn't work in new Firefox .Can you update it? Hi, I am not able to install the leethax extention on my fire fox for Facebook diamond dash. Once I finish installing the extention, a mesage pops up saying extention could not be installed as the file is corrupt. Please guide me how to solve my problem. Note: I have enabled all the extention installation permission in the security settings. Please be polite and stay on topic. Be sure you're commenting on the right page – off-topic comments will be deleted. If you're asking for help on something, first make sure the answer isn't already on this website (check the FAQ and the relevant pages). Important: If a cheat is not working as it should, follow the instructions in the FAQ.